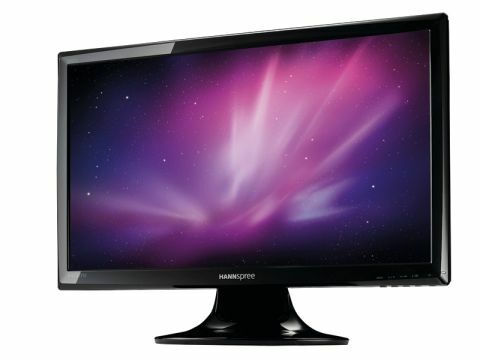 The Hannspree HF237HP impressive 23-inch widescreen monitor has inputs for VGA and HDMI, and comes bundled with a HDMI-to-DVI cable: just the thing if you want to use the same display for computing, high-definition movies and video games. The HF237HP boasts a sturdy base and a screen that can be tilted, but not vertically adjusted. It has decent viewing angles too, with colours that begin to shift at about 30 degrees to the screen on the horizontal plane, with the vertical angles being slightly weaker – this is very agreeable at the price. The lighting consistency is satisfying too, though it falls short of perfection. There's an over-bright band at the top of the screen and a slightly wider one at the bottom, but neither are very intense. Only the fussiest professionals would complain. Screen quality is also impressive. Snow Leopard's Aurora desktop is well realised, with good detail and contrast, though maybe a little bitty in the darker areas. The colour ramps in our gradients test were smooth and clear, and it did a great job of distinguishing between 95% and 100% black, a task that proves problematic for many budget monitors. It struggled a little with 5% and 0% black, but the distinction was there. Where the HF237 really falls down is in its integrated audio. The tinny, bass-free speakers pump out tunes that sound like overspill from the room next door, making them intolerable for anything other than basic computing.